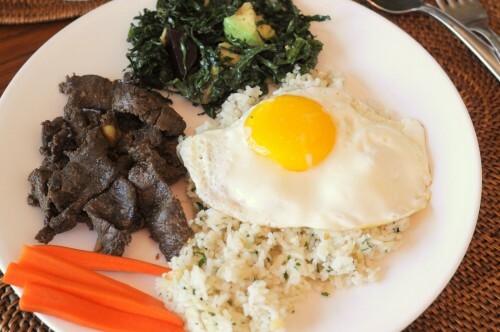 Tapsilog is short for tapa (cured beef), sinangag (garlic fried rice) and itlog (egg). The suffix “silog” is added to many protein sources such as ham-silog, hotdog-silog, daing-silog (daing – marinated milkfish) and longsilog (longganisa – sausage). Technically beef tapa is supposed to be air-dried beef, but I’ve been able to achieve the same result by just marinating the beef in a mixture of soy sauce and lemon. The package said this was london broil top round. I’m not versed in butcher cuts so I don’t really know the best cut of beef to use for this dish. The package for this one said London broil top round and it worked well. I suppose any kind of marbled and tender beef would achieve the same results. 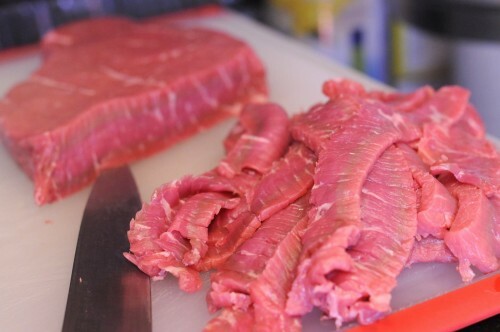 The beef is sliced thin enough to remain tender and absorb the flavors more easily. I like my beef tapa in strips like for stir-frying. I made a mixture of soy sauce, lemon, sugar (breaks the acid and makes it easier to brown the beef when frying), garlic and peppercorns. I soaked the beef in the solution for at least one day. The beef is strained and fried. It creates its own liquid where it is allowed to simmer until cooked. There is something unmistakably Pinoy about the smell of garlic rice, just like the burps it produces throughout the day. Making and consuming tapsilog reminds me of many breakfasts hurriedly consumed in college, eaten with a bowl of spicy vinegar and soy sauce spooned over the rice to conserve the meat as an economic measure. I judged the veracity of my hunger and my ability to make the most of the meat’s flavors by whether or not I ordered extra rice. Now that this meal isn’t so expensive anymore, the challenge is how to stop eating. Voila! 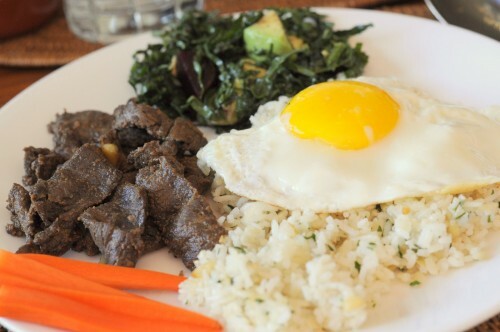 Marinate beef, fried egg, and garlic rice. Side of kale salad and pickled carrots. Mix the above ingredients together and marinate for at least 24 hours. Meat that won’t be cooked immediately may be stored bagged in the freezer. 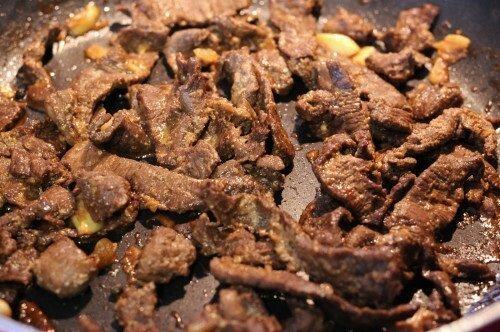 To cook, remove the meat from the marinade and fry in a hot non-stick pan, adding oil if necessary. 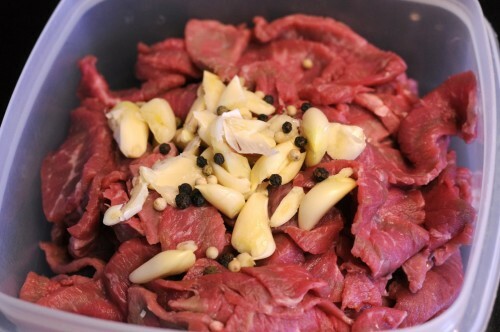 The beef produces a lot of liquid which will help it cook while simmering. Cook until brown and serve with garlic fried rice and eggs.